Do You Really Need More Than One Page? One of the things that came along was the advent of the multi-page website. It seemed so promising and useful. The only problem is that some companies don’t need multiple pages at all. In fact, with the mobile revolution, it doesn’t make much sense at all for the majority of companies. Think about it. The digital world is not like reading a book. With a physical magazine or a book, you need to have multiple pages to fit all the content on there. However, a digital website requires no such thing. What Are The Benefits of A One-Page Theme? Sure, a website like Amazon is so jam packed with products that it would be unthinkable to fit all of it on one page. However, small and mid-sized businesses can generally figure out ways to keep visitors on the homepage for the entire time. Even some of the most popular online magazines (with thousands of articles) are discovering methods for keeping users stuck on one page. How does this work? Well, it all starts with tools like one-page WordPress themes, lazy loading and infinite scrolling. Think about how often you lose customers just because they have to wait around too long to go to another page. With a one-page design, your customers are already viewing everything they need to see. Not to mention that mobile phones and other devices are primed for the one-page layout. There’s no need to click on small menu items and your users certainly don’t have to look around for tiny links. So, the one page WordPress theme is sticking around. Take a look to check out the best ones. Email us or leave a comment with a link to any theme you feel we should have included on our list. 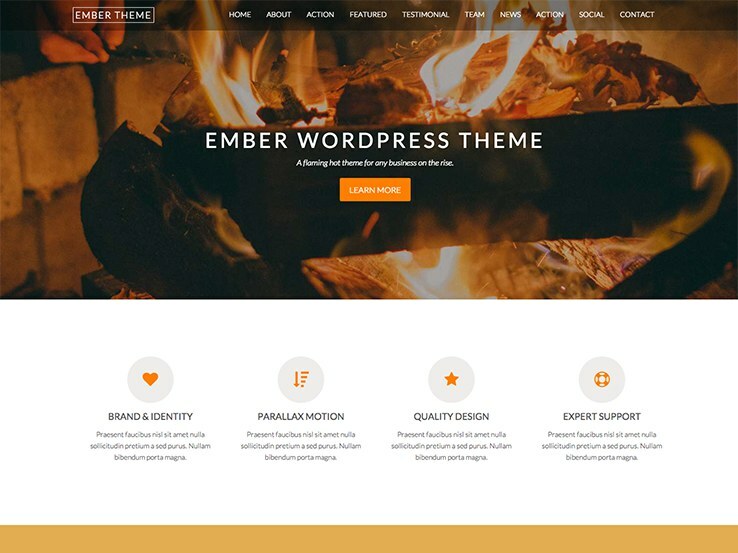 Ember is a beautiful, solid one page WordPress theme designed for individuals, businesses and organizations looking to connect with their customers in a fast and seamless way. This template comes with various useful features for business sites including WooCommerce compatibility, which enables you to easily set up an online shop for selling your products. Support for parallax scrolling means you’ll be able to create a modern fluid website that engages your users better. Ember’s other notable features include support for the premium Visual Composer plugin, unlimited color options, a fully mobile responsive design, mega menus, and more. Are you a creative agency, small business, startup, or freelancer looking to easily set up a modern professional website in minutes? 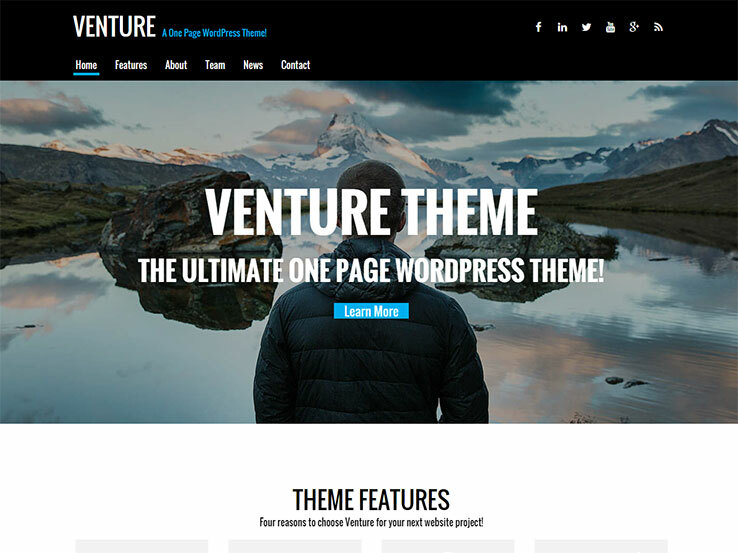 If yes, the Venture WordPress theme will make a great choice for you. This template features a sleek one-page layout that allows you to beautifully fit all your important content on the frontpage, eliminating the need for your customers to wait around too long for other pages to load. Setting up the theme to match your specific requirements is easy because it uses the WordPress core customizer.You get plenty of other features with Venture including WooCommerce integration, Visual Composer plugin support, parallax scrolling, and more. 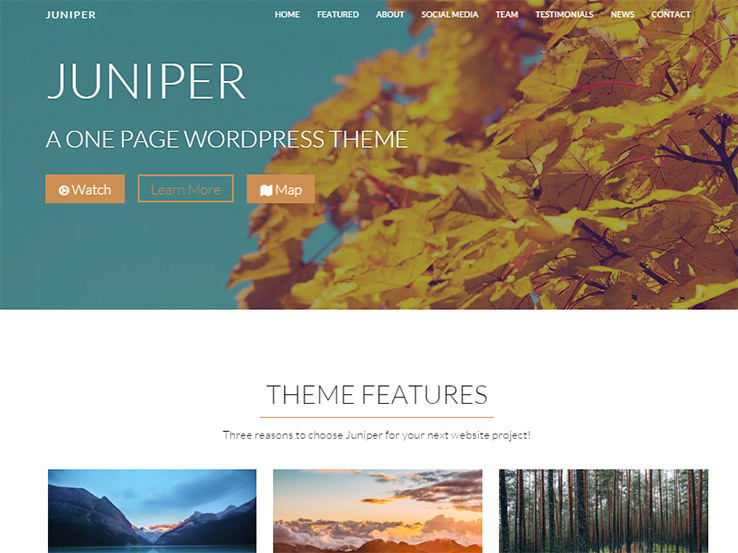 From Themeshift comes Juniper, a beautiful and elegant WordPress template ideal for the modern business that wants to easily connect with its potential or existing customers without the clutter and complexities that come with multi-page websites. Juniper is completely responsive and uses parallax design, which enhances user experience both on desktop and mobile devices. With this WordPress template, you also get WooCommerce support, unlimited color options to choose from, and a suite of high-quality custom widgets to build your frontpage. With the Awesome WordPress theme, you have quite a few tools to play around with and use them to customize your one-page layout. 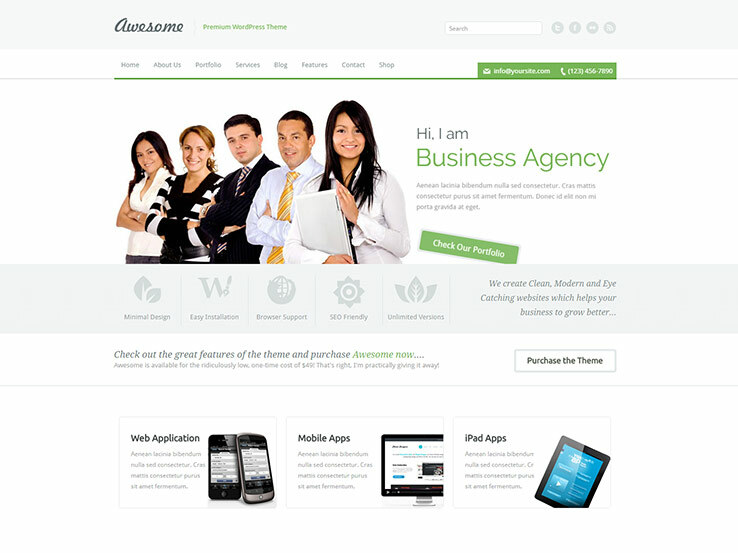 Starting out, this theme is geared primarily for companies that would like to present some sort of portfolio. For example, a design agency might have the desire to connect with clients for marketing work, so this would be a solid choice for that. The Awesome WordPress theme is completely responsive, which is a nice touch and the simple and clean layout is enough for us to recommend it to most of the businesses out there. The theme comes with WooCommerce integration, which is ideal for a one-page theme, considering you don’t have to have your entire product line scattered all over your site. Simply post some of the product listings on your homepage and use the rest of this space to show your customers what your company is all about. The two sliders are impressive due to the fact that they allow both overlaying text and buttons. Not all sliders are like this, so it’s important to discover which of them are going to bring in most sales for your business. The custom widgets turn your backend into more of a drag-and-drop interface, while the latest tweets widget introduces your company to a more social presence. Lots of other social sharing and following buttons are included with the Awesome WordPress theme. We like this for so many reasons. One of them is because you don’t have to go out and get a third-party plugin, but the other is because implementing the buttons on your homepage is pretty darn easy. The blog has AJAX load sections for speeding up the overall loading of your site. The unlimited color schemes are handy for branding and you also gain access to Google Web Fonts and translation-ready files. The AJAX filterable portfolio is the standout feature since it gives users a chance to navigate to the categories they actually care about. Along with frontpage options, built-in SEO, and custom shortcodes, the Awesome WordPress theme is in a class of its own. 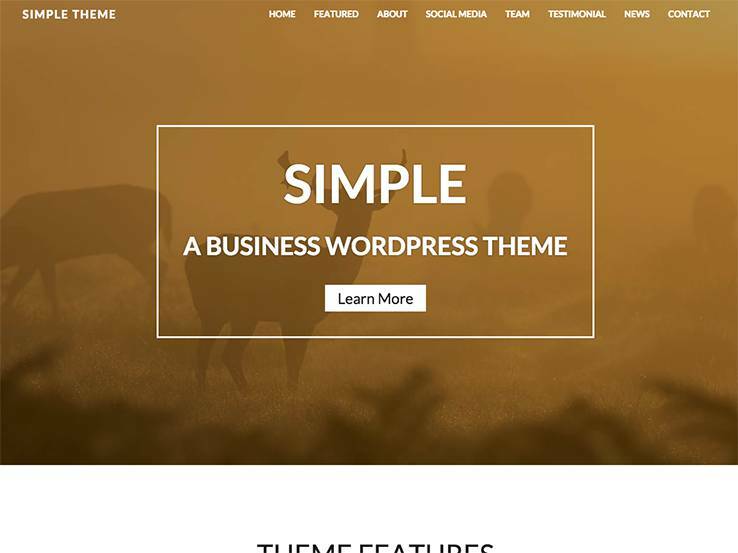 Simple is an awesome clean template that comes with lots of great features and is super easy to style – making it one of the best one-page WordPress themes for business websites. With this theme, you’ll be able to direct visitors through the important information on your website in a preset order thanks to parallax scrolling and the different sections available. The versatile layouts, unlimited color options and hundreds of font choices means you’ll be able to personalize your website to look just the way you want. And since the theme is developed by Nimbus, you’re guaranteed unlimited support whenever needed. 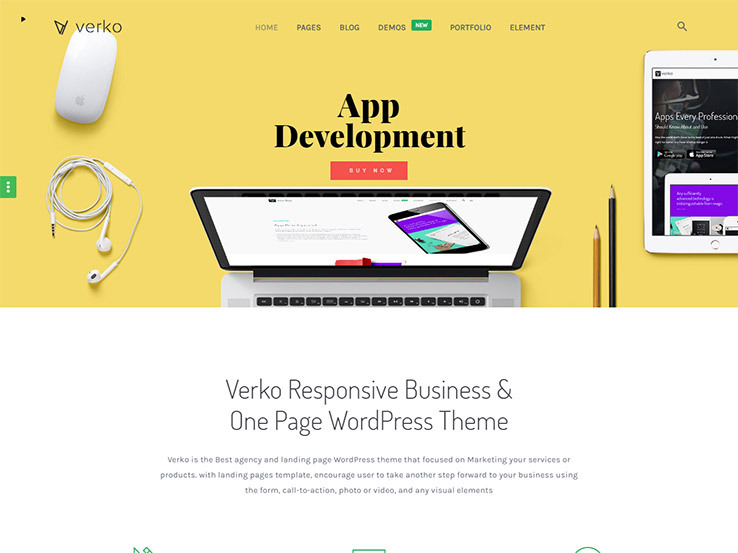 The Verko WordPress theme is one of the front-runners in the race for best one page WordPress theme. It’s a sleek little theme with responsive elements and tons of demos to get started with. If you wanted to establish your website as a place to sell a mobile app, it would only take a single click of the button to get started. A nice collection of shortcodes is included with the Verko WordPress theme, meaning that if you’d like to develop a button or column, it only takes a quick copy and paste. The sticky menu is a signature part of most one page themes since people will still want to see where they can navigate after moving down on the page. This is particularly true if your homepage is a long one. Along with that, the header features a full-width image for grabbing the attention and showing people what your business is all about. Include overlaying text and present one of your highest resolution photos. A parallax header is an option as well, but you don’t have to go with this if it’s not your style. The static image is completely fine, but we do tend to recommend at least trying out the parallax effect since it’s pretty impressive. The off-canvas sidebars and menus are a few of the features you won’t see on many other themes. It’s nice to see a setup where the user is only directed to the most important items on the page. Therefore, the full menu really isn’t all that important unless the user really wants to scroll over and see it. Overall, the Verko WordPress theme allows you to get your business up and running in a simple fashion. The one-page design looks wonderful and the additional tools are sure to assist you in your journey. 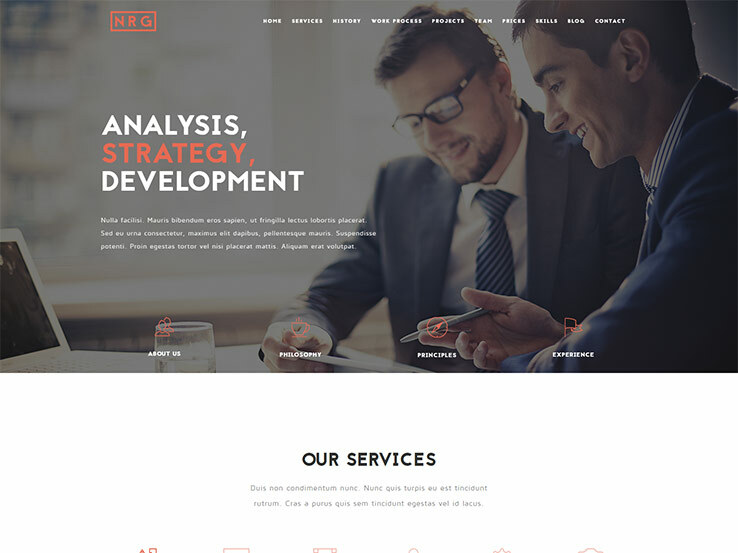 The NRG WordPress theme is a powerful theme for businesses. It has a solid one-page structure, and the layout is based on the standard business design of a header and service or product information right below that. The NRG WordPress theme delivers a beautiful responsive design, and it has the Visual Composer plugin on the backend with a drag-and-drop interface. The great thing about this plugin is that you don’t have to worry about touching any source code. Developers who have tons of experience love this and the beginners are bound to fall in love with it as well, considering they can make professional websites without being forced to go crazy with code. Another premium plugin is the Revolution Slider. This is the ideal solution if you’d like to get an image slider on your site. The photos are going to look incredible as long as you upload high-resolution imagery. The NRG WordPress theme has a one-click data import, which is pretty common with most themes these days, but it’s particularly nice for one-page themes since many people don’t know how to get started with these. The easy one-page sections actually aren’t that hard to configure, so if you’re thinking about talking about your services, products or people in your organization, all you have to do is go to the right module for customization. NRG has options for changing around the site colors. This improves the branding for your site and it combines well with the fonts that come along with the theme. You get access to a MailChimp subscribe form and the Contact Form 7 plugin makes it easy for potential clients to get in touch with you. 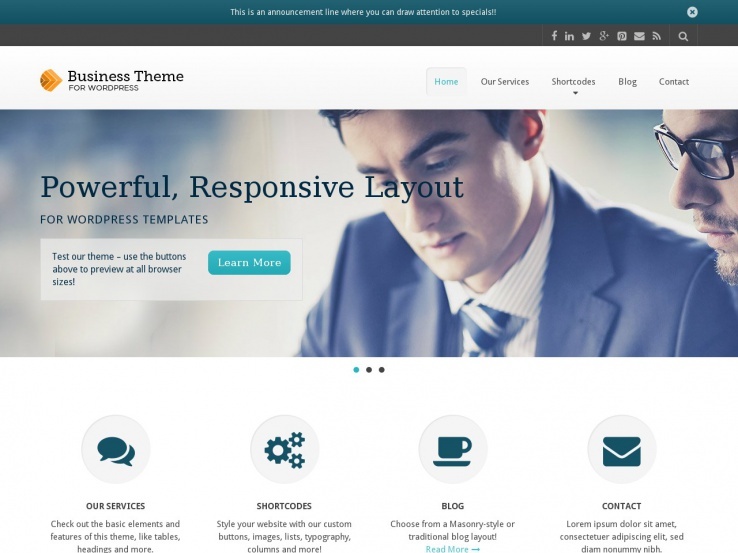 Business is a versatile, row-based frontpage WordPress theme that’s perfectly designed for all sorts of business websites. To start off, it features a beautiful slider that allows you to highlight the most important aspects of your business along with different sections for presenting your services, team members, testimonials, clients, and more. You can easily style and customize this template to make it your own thanks to the wide array of shortcodes available, typography options and the easy-to-use theme options panel. Other benefits that you get with the Business theme include ongoing updates, a fully responsive design, and social media integration options. 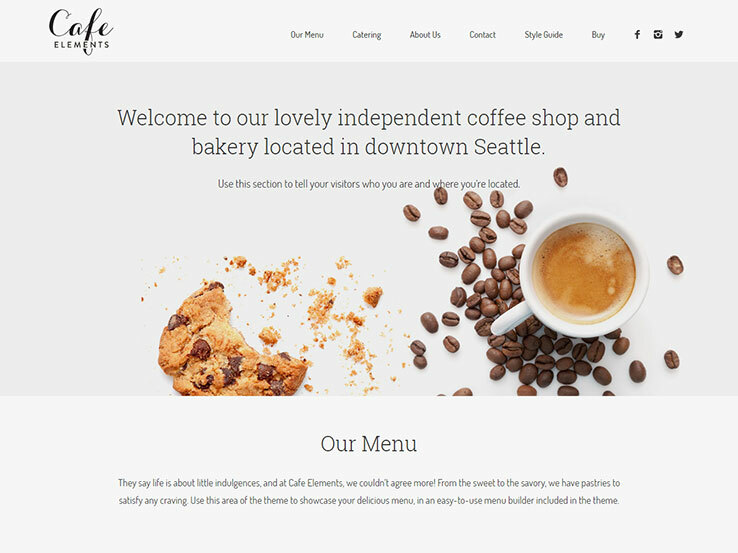 The Cafe Elements WordPress theme is a solid one-page theme for restaurants and cafes. It has several custom menus for guiding patrons to the right menus and the mobile responsive nature of the theme ensures that people can access your website even while they’re on the go. Social media buttons are included with the Cafe Elements WordPress theme, helping out companies that would like to build social presences. The documentation that comes along with the theme is rather helpful and the widgets are there for configuring the way your homepage looks. Most beginners shouldn’t have any problems when it comes to figuring out whether or not the design is going to work. You don’t have to touch any code, so most people can make a professional looking site without pulling their hair out. The sample content delivers a unique opportunity to launch your site within seconds. The translation files are perfect for translating your website and reaching an international audience. The majority of the homepage is taken up by imagery. These are great for showcasing your menus since users can click through to see more information, while also staying on the same page to consume most of the information they would need in the first place. 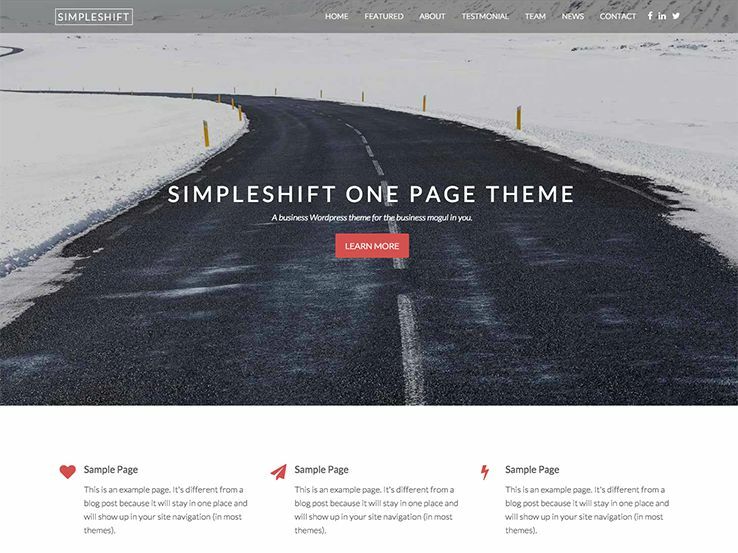 Simpleshift is a clean and flexible WordPress theme that you can easily customize to match the website needs of any type of business. Whether you are a small startup or a large agency, you’ll find that Simpleshift is the perfect template to quickly establish an effective online presence for your business thanks to its professional and user-friendly design. This template provides various sections for highlighting your services, testimonials, and team members, as well as a news section where you can tell the world about updates to your business, products or services. In terms of extras, compatibility with WooCommerce means you can easily set up an online shop for your business, while parallax effects will enhance the browsing experience for your visitors. 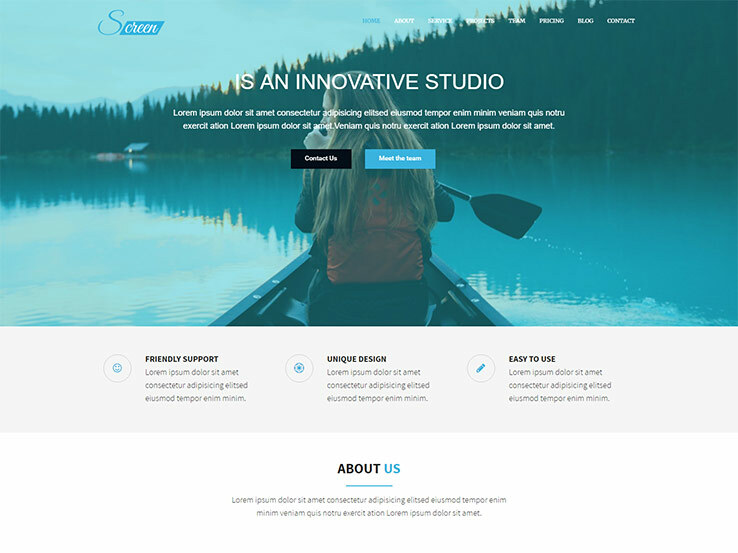 With Screen, you get a simple, clean WordPress theme perfect for any type of business website. Out of the box, this template comes with 8 different homepage examples. You can choose to have a front page with parallax effects, a slideshow, a text slider, a text rotator, or even a video. You also get several well-designed sections to display your services, projects, team members, pricing, and blogs. Other features of Screen include a powerful admin panel for managing your site, compatibility with the WPML plugin for translating your site, and Google Map support so potential customers can easily establish your physical location. 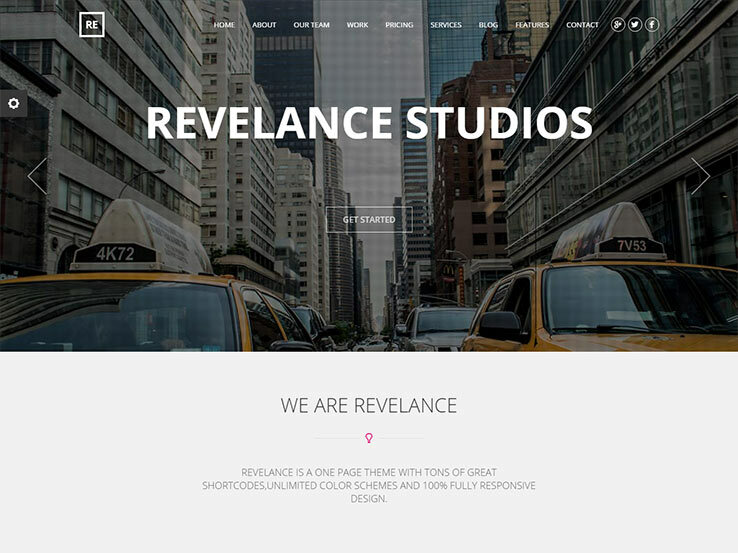 Relevance is an elegant drag-and-drop parallax theme ideal for all kinds of agencies. With this template, you get a great collection of elements to build the perfect landing page for your products or services. The theme comes with 4 different home page layouts – so you can easily find one that fits your specific needs. Additionally, you get a variety of page styles and blog pages to choose from. Relevance looks awesome on any screen size since it uses responsive design and is Retina-ready. The theme’s other useful features include unlimited color options, shortcodes, unique portfolio styles, a live customizer, and more. You also get premium plugins like Visual Composer and Slider Revolution for free with Identity. And in case you have any questions, you’ll get quick and helpful support from ProfTeam Solutions, the theme’s developer. 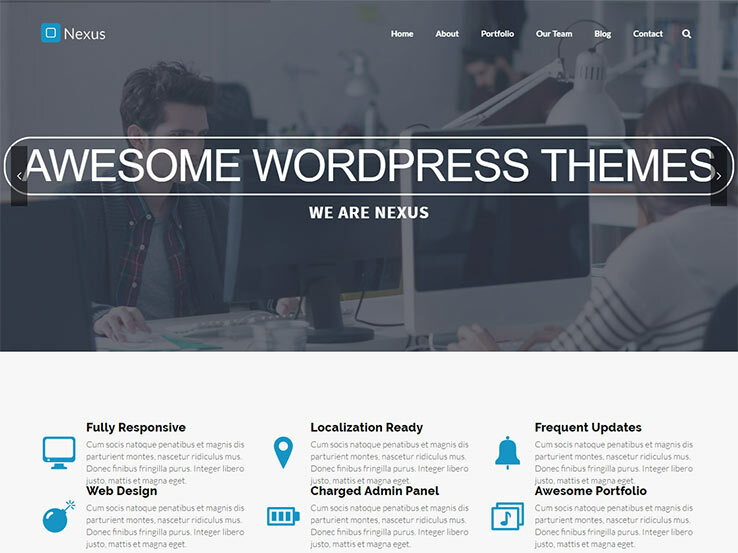 If you’re looking for a clean, feature-packed one page WordPress theme for your business website, Nexus might just be what you want. This template comes with many possibilities, including the option to choose a fixed, slider, or video header. Since Nexus is fully customizable, you can easily style colors, backgrounds, fonts and more to suit your preferences. You can also connect your social media pages within minutes thanks to the theme’s integration with many different social networks. Moreover, Nexus comes packaged with several premium plugins such as Layer Slider, Visual Composer and LivIcons; so you won’t have to separately purchase these WordPress addons. 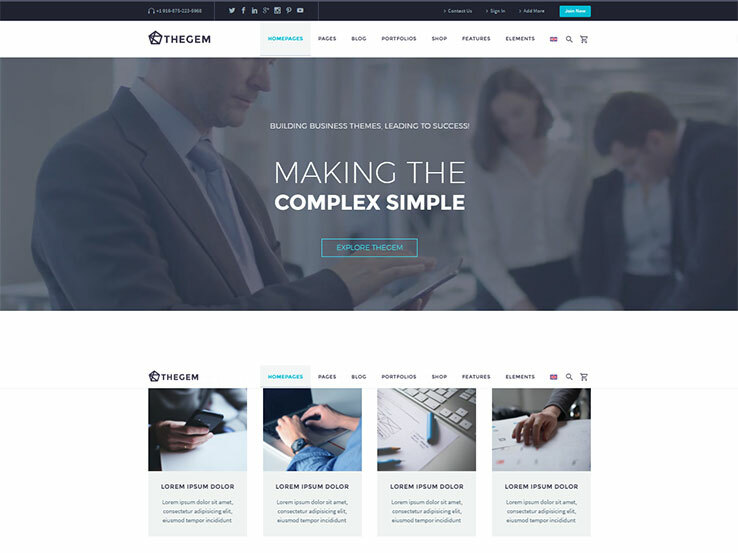 TheGem is a versatile feature-packed WordPress template that will help you build an impressive single-page website for your business. The theme features a well-thought-out design with impressive parallax scrolling that will ensure your visitors can quickly find what they’re looking for. With over 50 pre-made page layouts to choose from and unlimited customization options, you’ll have a unique modern website within minutes; whether you’re a startup or an established business. Besides, you get 20+ custom widgets to quickly setup your site in drag-and-drop style, light weight & SEO-friendly code as well as a fully responsive design that looks great on any device and screen. Built by Modeltheme, Linify is a professionally designed template with a bold full-screen header that allows you to quickly highlight your most important message. The theme comes with many useful features for a business site including 10 unique home pages to choose from, services and member sections, pricing tables, and a beautiful contact form for potential customers to easily reach you. In addition, Linify comes with a user-friendly theme options panel for easy customization, video and background parallax, as well as premium plugins like the Visual Composer drag-and-drop page builder, Mega Main Menu and Slider Revolution that will save you further costs. Are you looking for a clean and modern website to showcase your portfolio? If yes, WP Starta might be the solution you’re looking for. 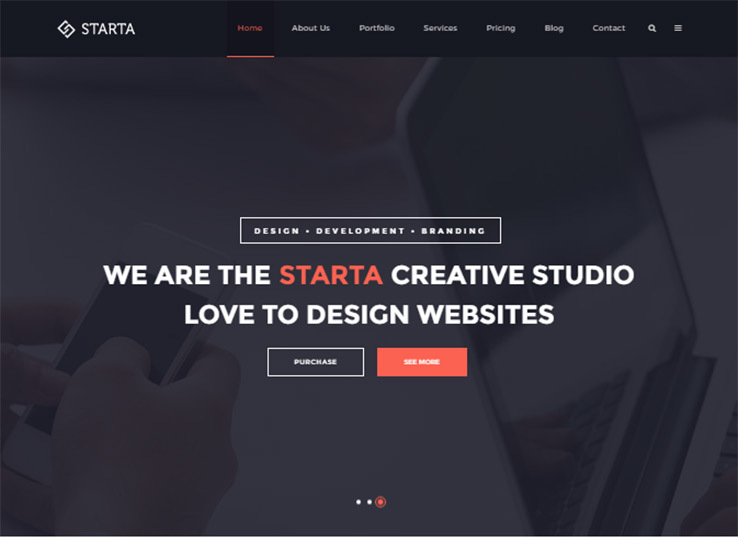 Whether you are a corporate or a creative agency, this template provides the features to build a beautiful and functional website for just about any type of business. Since the theme is built on Twitter Bootstrap, you can easily add different elements to your site using the wide range of supported shortcodes and plugins. Different premium plugins are included with the theme for free including Slider Revolution and the Visual Composer plugin for building your pages more easily. 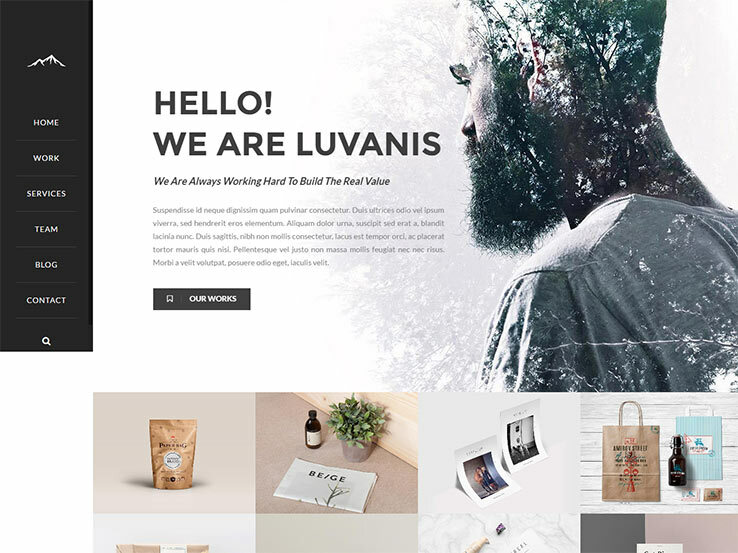 With Luvaniz, you get a clean, professionally designed one page WordPress theme to help you build a modern and stylish website for your business. 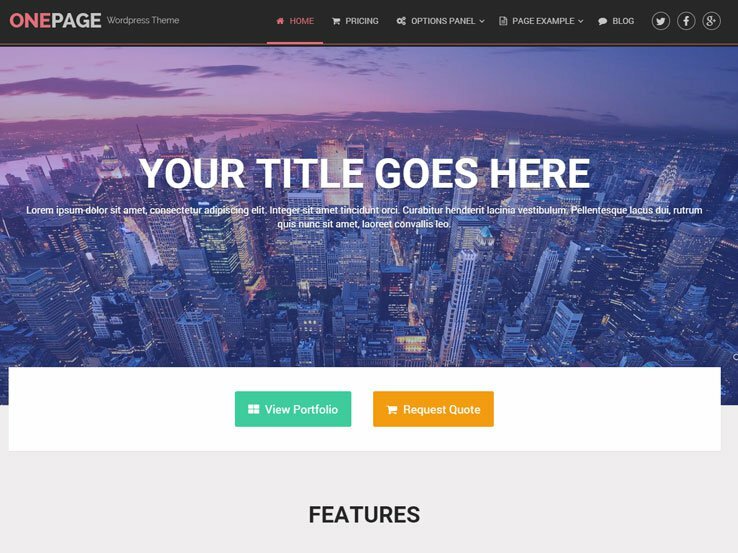 This template comes with many awesome features including 4 different pre-made homepages and one click demo content import to quickly get you started, a powerful admin panel with many options for styling your site as well as beautiful portfolio sections for displaying your past work. Other notable features of Luvaniz include the ability to build a multilingual site, over 20 shortcode modules and unlimited sidebars and color options. You also get lifetime updates and professional support 24/7 with this theme. 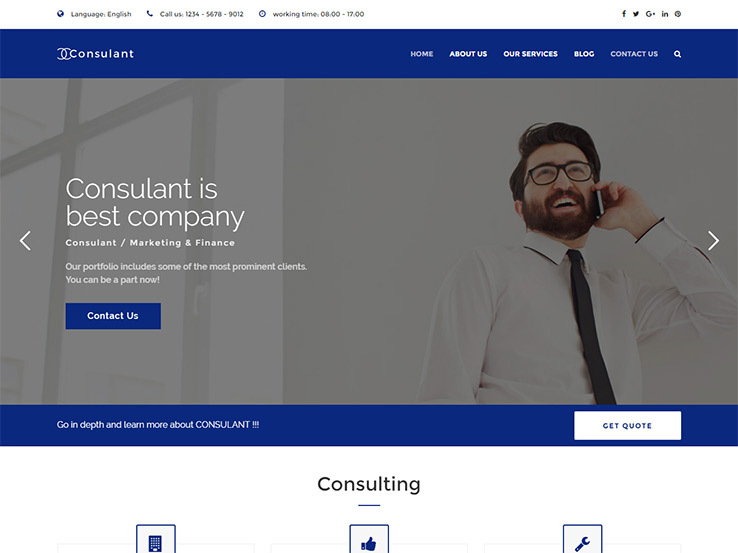 Consultant is a slick and professional WordPress template with all the great features you need to run a successful corporate or business website. To start with, the theme features a clean design with lots of whitespace that allow visitors to focus on your most important content. The theme comes with the premium Visual Composer page builder plugin – so, building your site will be quick and easy with no need for you to mess with code. You also get a powerful admin panel for styling your site, a responsive and Retina-ready design that looks great on all devices, as well as 24/7 support from the theme developer. 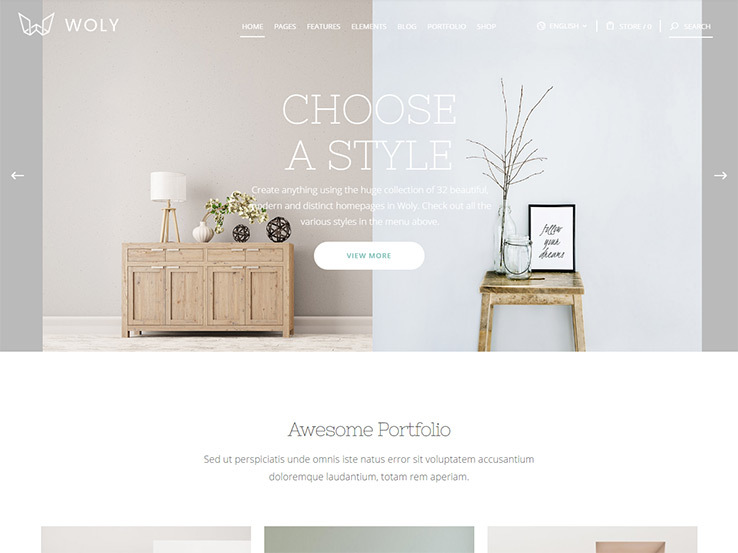 Woly is a modern and stylish theme with many powerful options and useful functionalities that will enable you to build an effective web presence for your business. The template comes with some fantastic features, such as beautiful pre-made portfolio layouts for showcasing your work, 32 pre-made homepages to choose from, and support for the powerful WooCommerce plugin that enables you to create an online shop in a jiffy. Moreover, Woly provides a range of typography options and color palettes to suit any style, a powerful admin panel, social media integration options, and much more. 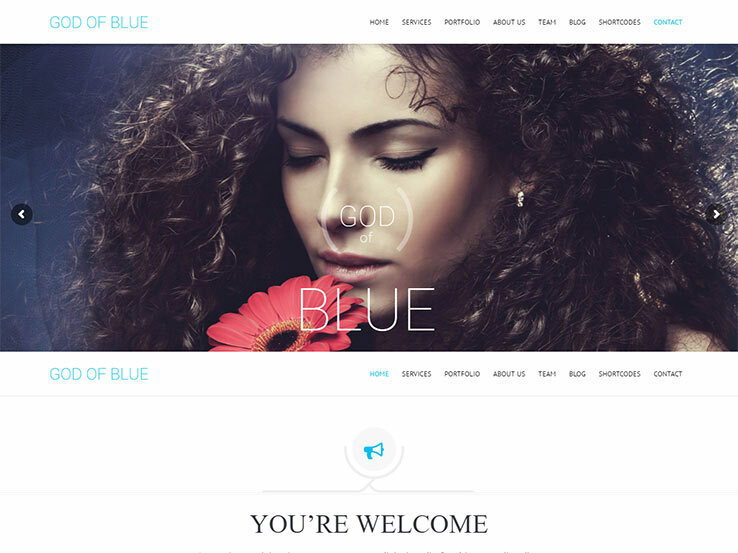 God of Blue is a versatile and fully responsive WordPress theme perfect for business websites that want to stand out from the crowd. With this carefully-crafted template, you get the opportunity to beautifully present the different aspects of your business in a single page – showcase your services, portfolio, workflow, team members, and more. In terms of styling, the theme offers many different customization options to suit different tastes. You can play around with fonts, change backgrounds for different sections, adjust colors, and much more. Additionally, you get parallax sections with attractive scrolling, a sticky header, translation files, and more. If you are looking to establish a powerful online presence for your business, Globy is a great starting point. 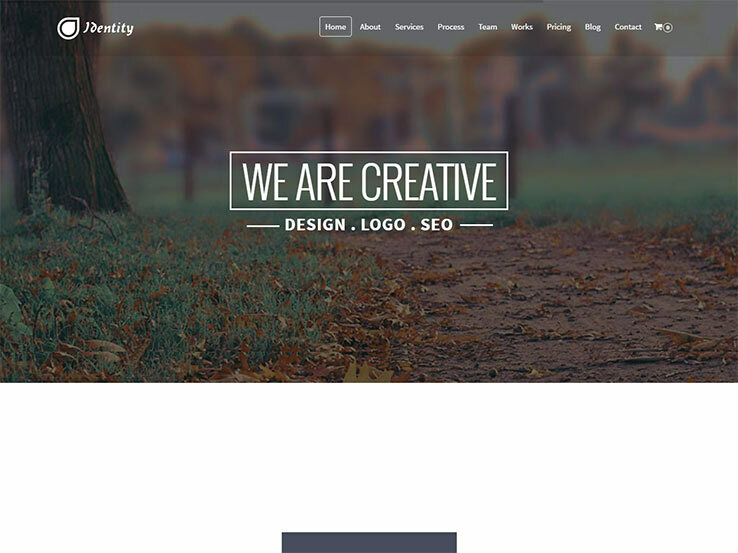 This awesome theme comes with a smooth and clean layout and features a moving globe in the header that will quickly grab the attention of your visitors. Since the template is designed to accommodate a lot of information on a single page, all sections of your site will look awesome and visitors will be happy to find what they’re looking for without clicking around. 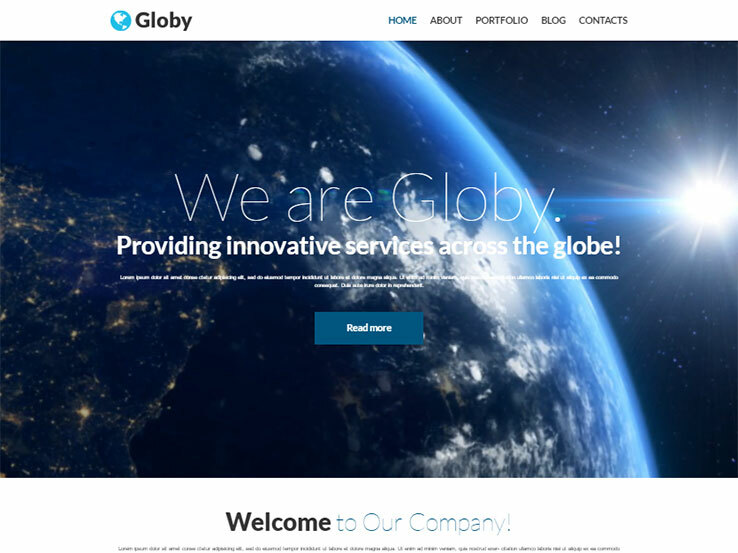 Globy’s other features include parallax scrolling, support for background videos, charts, different layout options, and more. OnePage is a handcrafted creative portfolio and business theme that features a drag-and-drop frontpage layout along with a robust theme options panel to customize your site easily. It includes many business-related parts such as a portfolio section, testimonials and a clients section where you can feature your best customers. Besides, you get a pricing table if you wish to display your pricing packages and a counter to show off your business statistics. Other key features include unlimited color options, clean fast-loading code, Twitter integration, and a responsive design that displays perfectly on all devices. 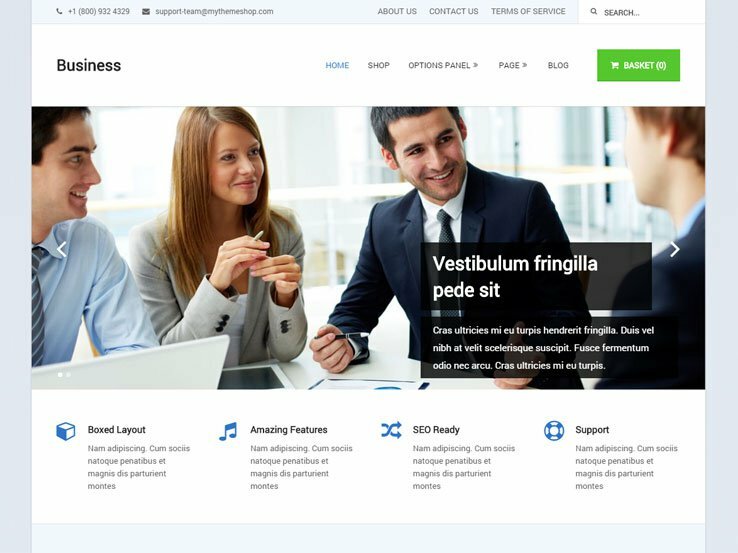 Just like the name suggests, Business is a professionally-designed and fully responsive website template for corporates and businesses looking to create a clear impression on their prospects. The theme comes with a variety of layouts and is completely customizable, allowing you to create a site that looks just the way you want. Many different social media buttons are integrated with this template, allowing you to get more business from social media. Besides, the theme is compatible with WooCommerce and is designed with parallax scrolling effects and SEO in mind. 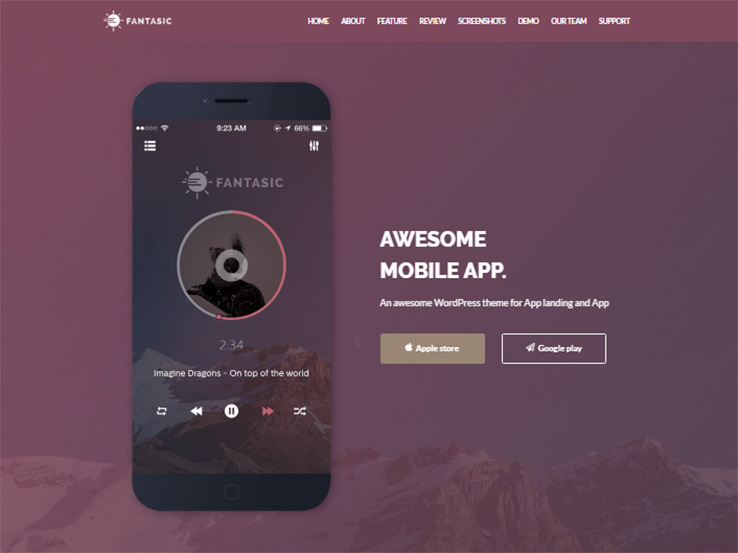 Fantastic is an innovative user-friendly WordPress template that features a clean and modern design. The theme comes with 6+ homepage layouts to get you started quickly, and you can also build your own from scratch thanks to the easy-to-use point-and-click site builder. In addition, Fantastic includes customizable pricing tables if you’d like to display your pricing packages, 4 awesome testimonial styles and a ready-made contact form for potential customers to easily reach out to you. Other useful features of this template include support for WooCommerce, a responsive design, SEO-friendly code and built-in support with live chats.